Purpose: In the present study, the performance of four VMAT beam arrangements used for hippocampal-sparing whole-brain radiation therapy is addressed. Material and Methods: Data corresponding to 20 patients were utilized so as to generate plans for every beam configuration. A preliminary study was conducted to assess the optimal distance between optimization structures (PTVx) and hippocampi. V25, V30, D50%, D2%, D98%, homogeneity index (HI) and Paddick conformity factor (CF) were evaluated for PTV. D100% and Dmax were considered for hippocampi. All plans were required to perform at least as recommended in RTOG 0933 trial regarding organs at risk (OAR) sparing and PTV objectives. Results: Considerable hippocampi sparing alongside with a reasonably low decrease in PTV coverage was achieved using a 7 mm distance between hippocampi and PTV optimization structure. Beam setup 3 (comprised of two full arcs with 0° couch angle and two half arcs with 90° couch angle) achieved the best PTV coverage, HI and CF, while it performed the second-best sparing in hippocampi and lenses. Moreover, beam setup 3 was the second-fastest treatment, although it resulted in the highest number of delivered MU among all beam setups. Beam setup 1 (comprised of two full arcs with no couch angles) was the fastest and it delivered a significantly less amount of monitor units compared with the other beam setups evaluated. Furthermore, a higher robustness was obtained by using no couch angles. Although beam setup 1 was the least optimal considering OAR sparing, it still performed better than required in the RTOG 0933 trial. Conclusions: Overall, beam setup 3 was considered to be the best. It is worth mentioning that, apart from our results, the election of one of these beam arrangements might be dependent on the amount of patient workload at a specific institution. Purpose: The purpose of the present study was to evaluate the practicability of liquid ionization chamber (LIC) for pretreatment dose verification of the advanced radiotherapy techniques such as volumetric modulated arc therapy (VMAT). Materials and Methods: The dosimetric characteristics of LIC such as repeatability, sensitivity, monitor unit linearity, dose rate dependence, angular dependence, voltage-current response, and output factors were investigated in 6 MV therapeutic X-ray beams. The LIC was cross-calibrated against 0.125-cc air-filled thimble ionization chamber. 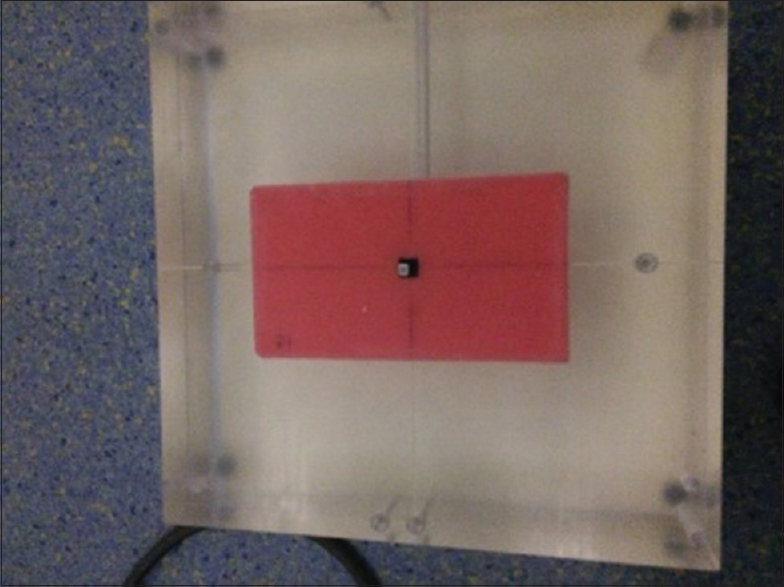 A dedicated dosimetry insert made up of Perspex to incorporate the LIC at proper location in the intensity-modulated radiation therapy thorax phantom was locally fabricated. The collection efficiency and ion recombination correction factor was determined using the two-dose rate method. Pretreatment dose verification measurement of VMAT treatment plans were carried out using the liquid ionization chamber as well as small volume (0.125 cc) air-filled thimble ionization chamber. 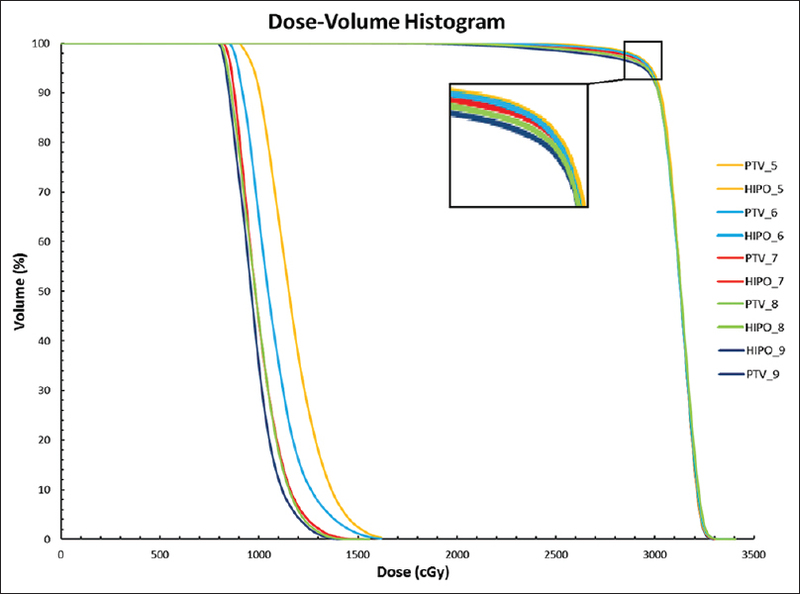 The measured dose values by the two dosimeters and TPS calculated dose at a given point were compared. Results: The relative percentage differences between the TPS calculated and measured doses were within ± 1.57% for LIC and ± 2.21% for 0.125 cc ionization chamber, respectively. Conclusions: The measured dose values by the two dosimeters and TPS calculated dose at a given point were found comparable suggesting that the LIC could be a good choice of dosimeter for pretreatment dose verification in VMAT. Purpose: PerFRACTION™ is a three-dimensional (3D) in vivo electronic portal imaging device-based dosimetry software. To validate the software, three phantoms with different inserts (2D array, ionization chamber, and inhomogeneity materials) were constructed to evaluate point dose and fluence map. 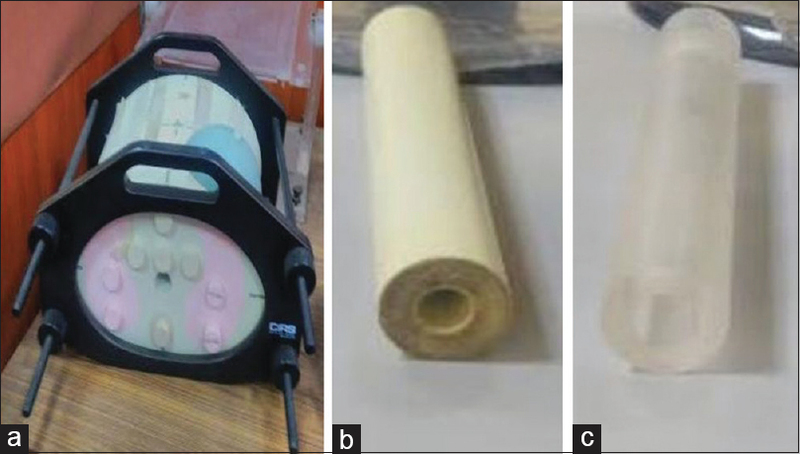 Materials and Methods: Phantoms underwent independent computed tomography simulation for planning and received repetitive fractions of volumetric modulated arc therapy, simulating prostate treatment. Fluence and absolute point dose measurements, PerFRACTION™ reconstructed doses, and the dose predictions of the planning system were compared. Results: There was concordance between ionization chamber and PerFRACTION™ 3D absolute point dose measurements. Close agreement was also obtained between X- and Y-axis dose profiles with PerFRACTION™ calculated doses, MapCHECK measured doses, and planning system predicted doses. Setup shifts significantly influenced 2D gamma passing rates in PerFRACTION™ software. Conclusions: PerFRACTIONTM appears reliable and valid under experimental conditions in air and with phantoms. 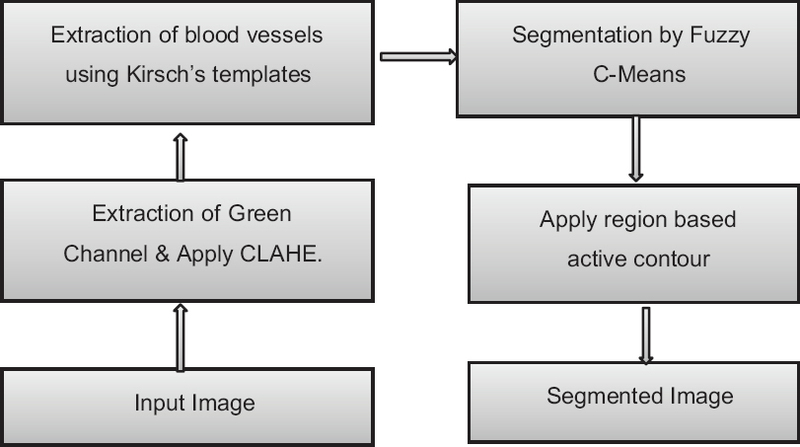 Purpose: Accurate segmentation of retinal blood vessel is an important task in computer-aided diagnosis and surgery planning of diabetic retinopathy. Despite the high-resolution of photographs in fundus photography, the contrast between the blood vessels and the retinal background tends to be poor. Materials and Methods: In this proposed method, contrast-limited adaptive histogram equalization is used for noise cancellation and improving the local contrast of the image. By uniform distribution of gray values, it enhances the image and makes the hidden features more visible. The extraction of the retinal blood vessel depends on two levels of optimization. The first level is the extraction of blood vessels from the retinal image using Kirsch's templates. The second level is used to find the coarse vessels with the assistance of the unsupervised method of Fuzzy C-Means clustering. After segmentation, to remove the optic disc, the region-based active contour method is used. The proposed system is evaluated using DRIVE dataset with 40 images. Results: The performance of the proposed approach is comparable with state of the art techniques. The proposed technique outperforms the existing techniques by achieving an accuracy of 99.55%, sensitivity of 71.83%, and specificity of 99.86% in the experimental setup. Conclusion: The results show that this approach is a suitable alternative technique for the supervised method and it is support for similar fundus images dataset. 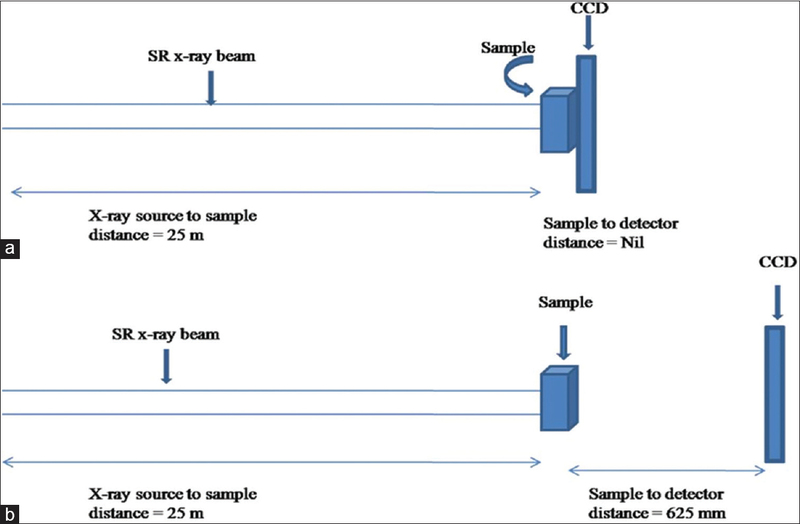 Aim: The aim of this study was to investigate the adequacy of nanoDot optically stimulated luminescence (OSL) dosimeter for small field dosimetry before its in vivo applications in CyberKnife SRS unit. Materials and Methods: A PTW 60018 SRS Diode, 60019 microDiamond, and Gafchromic EBT3 films were used along with a nanoDot carbon-doped aluminum oxide OSL dosimeter to collect and compare beam data. In addition, the EGSnrc/BEAMnrc code was employed to simulate 6-MV photon beams of CyberKnife SRS system. Results: All detectors showed good consistency with each other in output factor measurements for cone sizes of 15 mm or more. The differences were maintained within 3% for these cones. However, OSL output factors showed higher discrepancies compared to those of other detectors for smaller cones wherein the difference reached nearly 40% for cone size of 5 mm. Depending on the performance of OSL dosimeter in terms of output factors, percentage depth doses (PDDs) were only measured for cones equal to or larger than 15 mm. The differences in PDD measurements were within 5% for depths in the range of 5–200 mm. Conclusion: Its low reliable readings for cones smaller than 15 mm should be considered before its in vivo applications of Cyberknife system. Purpose: The purpose of this study is to build a system for effective dose display immediately after the gastric cancer X-ray screening. Materials and Methods: The regression equation of effective dose and dose area product (DAP) was introduced from the data of 500 persons including DAP and effective dose calculated using program for X-ray Monte Carlo. Results: The effective dose was 5.39 mSv of median, 1.18 mSv of minimum, and 38.38 mSv of maximum. The regression equation was Y=0.354+0.0003772X (Y: effective dose, mSv, X: DAP, mGy cm2). Using the regression equation, the effective dose can be estimated from DAP and displayed just after the individual screening. Conclusions: “Effective dose display system” was constructed to display effective dose immediately after gastric cancer X-ray screening. This system is on the way to be reformed by improving the regression equation on larger data. Introduction: Use of synchrotron radiation (SR) X-ray source in medical imaging has shown great potential for improving soft-tissue image contrast such as the breast. The present study demonstrates quantitative X-ray phase-contrast imaging (XPCI) technique derived from propagation-dependent phase change observed in the breast tissue-equivalent test materials. 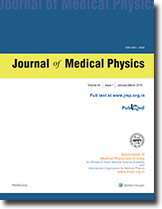 Materials and Methods: Indian synchrotron facility (Indus-2, Raja Ramanna Centre of Advanced Technology [RRCAT]) was used to carry out phantom feasibility study on phase-contrast mammography. 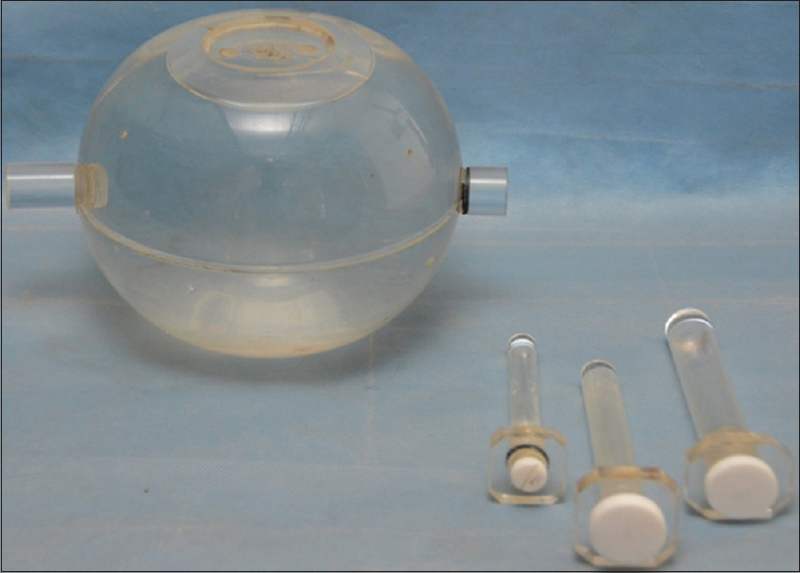 Different phantoms and samples, including locally fabricated breast tissue-equivalent phantoms were used to perform absorption and phase mode imaging using 12 and 16 keV SR X-ray beam. Edge-enhancement index (EEI) and edge enhancement to noise ratio (EE/N) were measured for all the images. Absorbed dose to air values were calculated for 12 and 16 keV SR X-ray beam using the measured SR X-ray photon flux at the object plane and by applying the standard radiation dosimetry formalism. Results and Conclusion: It was observed in case of all the phantoms and test samples that EEI and EE/N values are relatively higher for images taken in the phase mode. The absorbed dose to air at imaging plane was found to be 75.59 mGy and 28.9 mGy for 12 and 16 keV SR energies, respectively. However, these dose values can be optimized by reducing the image acquisition time without compromising the image quality when clinical samples are imaged. This work demonstrates the feasibility of XPCI in mammography using 12 and 16 keV SR X-ray beams. Aim: This study aims to develop a method using dual-energy computed tomography (DECT) to determine the effective atomic number and electron density of substances. Materials and Methods: Ten chemical substances of pure analytical grade were obtained from various manufacturers. These chemicals were pelletized using a hydraulic press. These pellets were scanned using DECT. A relation was obtained for the pellet's atomic number and electron density with their CT number or Hounsfield unit (HU) values. Calibration coefficients were determined. Five new chemical pellets were scanned, and their effective atomic number and electron densities were determined using the calibration coefficients to test the efficacy of the calibration method. Results: The results obtained for effective atomic number and electron density from the HU number of DECT images were within ±5% and ±3%, respectively, of their actual values. Conclusions: DECT can be used as an effective tool for determining the effective atomic number and electron density of high atomic number substance. Purpose: The purpose of the present study is to carry out radiation shielding calculations to find out adequate thicknesses of protective barriers such as walls and ceiling based on minimum space required to house helical tomotherapy unit. This study also aim to derive expression for use factor and estimation of patient workload for tomotherapy facility for optimizing radiation shielding requirements.Materials and Methods: The basic definitions and formulae given in NCRP/IAEA reports were referred and modified for tomotherapy machine to calculate optimized shielding thicknesses requirements. Workload is estimated based on observations of patient treatments on tomotherapy machine and analysis of their treatment plan data. A mathematical expression is derived for calculating use factor in terms of beam divergence angle at source corresponding to field length, angle of source rotation about isocenter, and distance of primary barrier from isocenter. Radiation shielding requirement of protective barriers such as walls and ceiling of helical tomotherapy vault is calculated based on minimum room dimensions as specified by the manufacturer, permissible dose limit (s), and values of optimizing parameters such as workload, use factor etc. for tomotherapy machine. 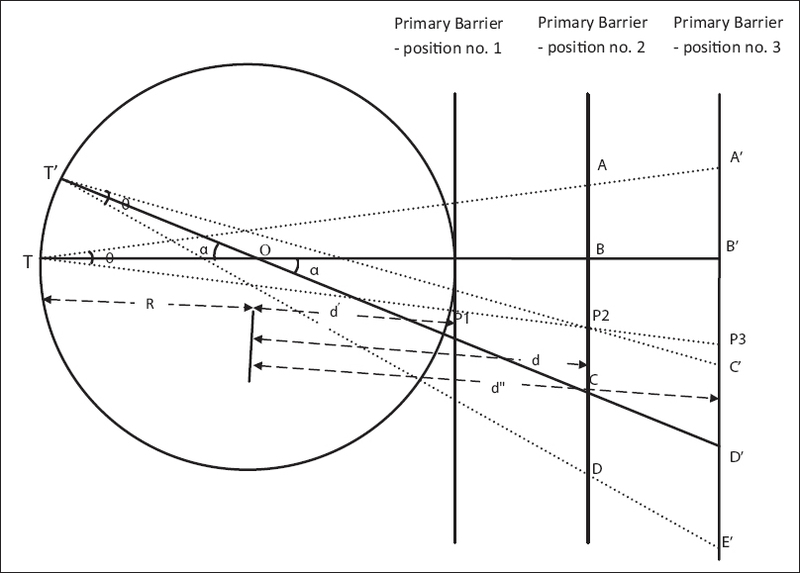 Results: Using derived mathematical expression for use factor in this study, it was found that value of use factor varies with distance of primary barrier from isocenter and its value was found to be 0.093 for given minimum room dimensions. Radiation shielding requirements for protective barriers (walls/ceiling, etc.) were arrived and reported in this paper. Conclusions: A typical helical tomotherapy vault design is proposed based on the calculated shielding thicknesses of protective barriers. Further, it is also concluded that tomotherapy machine can be installed in a vault designed for 6 MV conventional linear accelerator with minor modification. Context: In advanced radiotherapy techniques such as three-dimensional conformal radiotherapy (3DCRT) and intensity-modulated radiotherapy (IMRT), geometrical uncertainties are very crucial as they may lead to under dosing of tumor and over dosing of the nearby critical structures and hence, it is important to determine planning target volume (PTV) margins which are specific for every center. Aims: The aim of this study is to determine adequate clinical target volume (CTV) to PTV margins specific to our radiotherapy center. Settings and Design: To calculate CTV to PTV margins for rectal cancer patients in prone position using kV cone beam CBCT data sets. Materials and Methods: With the Patient immobilized in prone position using thermoplastic mask, a CT simulation was done and a comprehensive 3DCRT plan was generated. Daily kV CBCT was done to check the patient setup error. Daily setup errors were recorded and evaluated retrospectively. Results: CTV-PTV margin calculated for pelvis in the prone position was calculated using van Herk Formula and were found to be 0.5, 1.8, 0.7 cm in the lateral, longitudinal, and vertical directions, respectively. Conclusions: Image guidance is an effective method to evaluate patient setup errors. Good quality immobilization devices and stringent patient setup policies can help to reduce PTV margins further.